Shiraz has been a city for as long as Iran was. The city goes back at least to Neolithic times. Shiraz was the capital of Zand Persia and was a center of Art and Culture. In the modern era Shiraz is the dominant market city of Southwest Iran. 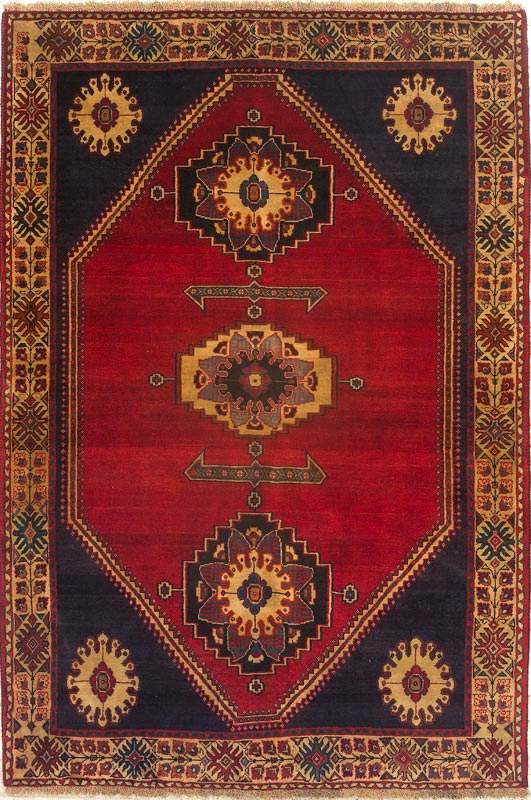 Shiraz Rugs are an easily recognisable group in the marketplace but the rugs come from a mixed origin. As a group they draw on the traditions of the weavers. There are Qashqai, groups formerly in the Khamseh Confederation, Afshar, Lori, Bahktiari, and even Baluch as well as persian Vilagers. 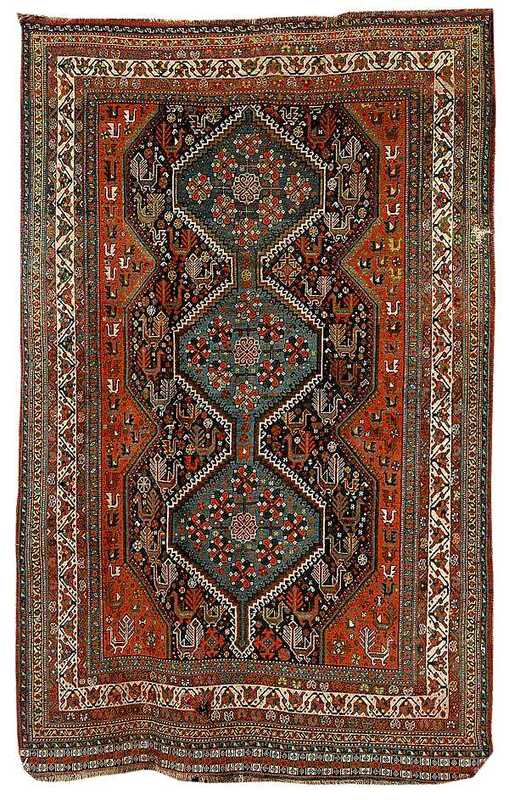 As families settled and underwent Persianification particularly under the White Revolution the rugs changed. 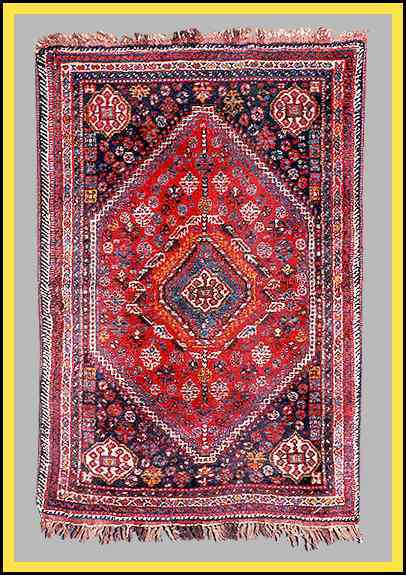 Sure we can at times see the origins of rugs but even if we know that a rug derives from Qahqai for instance a Shiraz rug will still be enough different to be a seperate type. 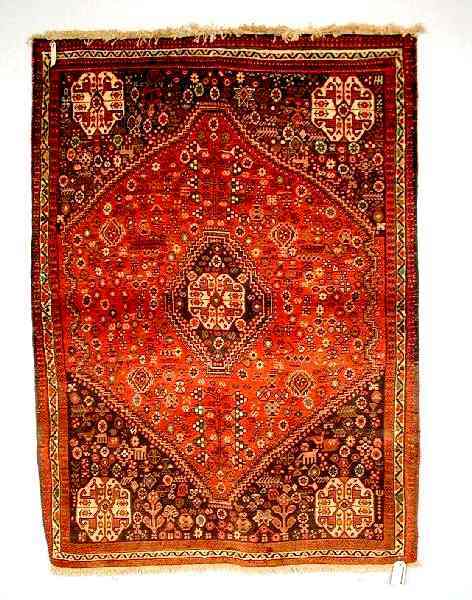 One of the key differences is that while there has long been a commercial aspect to Qashqai rugs their Shiraz derivatives are made to sell and not to use. Large, very thick, heavy Shiraz Area Carpet. 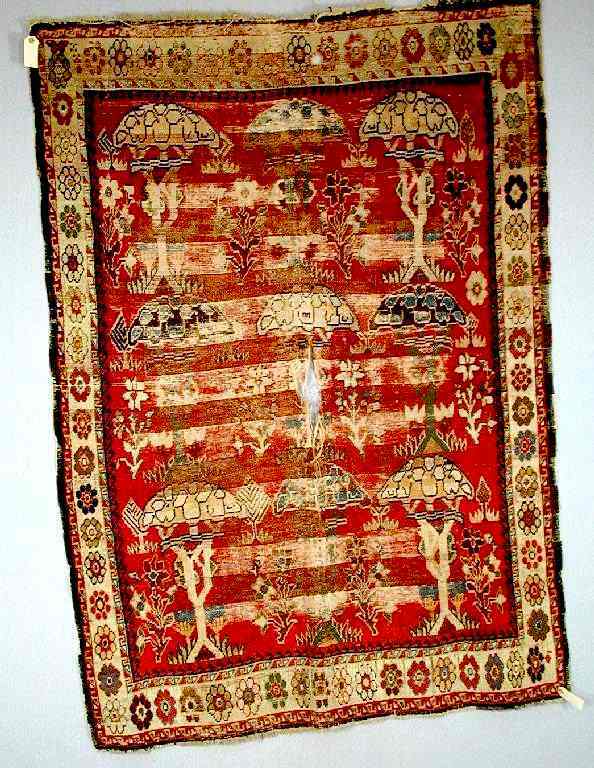 These carpets are the product of skilled village weavers. This rug is very heavy and it is rectangular. The picture is a little off because the picture was taken at an angle. 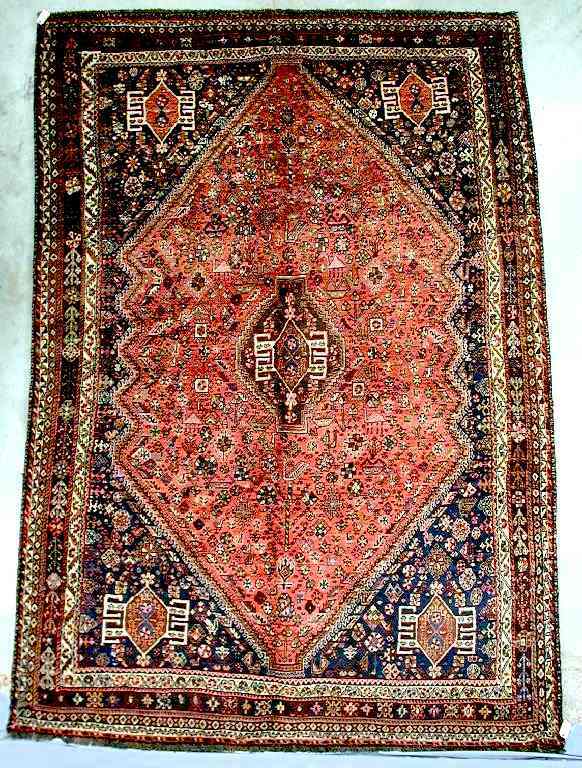 Shiraz Rug Shiraz. Iran, Early 20th century. 9 foot by 4 foot 11 inch. Structure: Symmetrical knot. 7 knots per horizontal inch and 5 knots per vertical inch. 64 per square inch (992 per square decimeter) Flat back. Warp: 2 ply hand spun wool, white, gray, brown and barber poled. Weft: 2 ply Wool 2 shots. gray. Selvages: Red and blue Shirazi wrap over 8 warp units selvage has a few small cuts but is structurally sound. 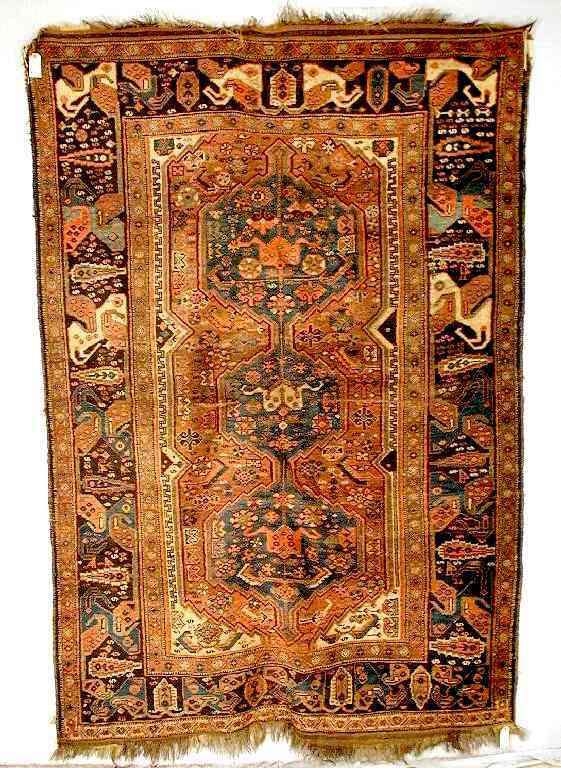 Further Notes: Supple but substantial handle handle, very substantial rug New condition. No holes, tears, rips or low spots. 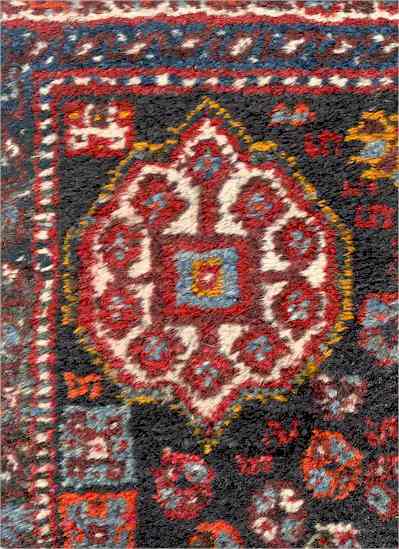 Size: 3 foot 8 inch by 5 foot 5 inch.This is a Shiraz village rug. 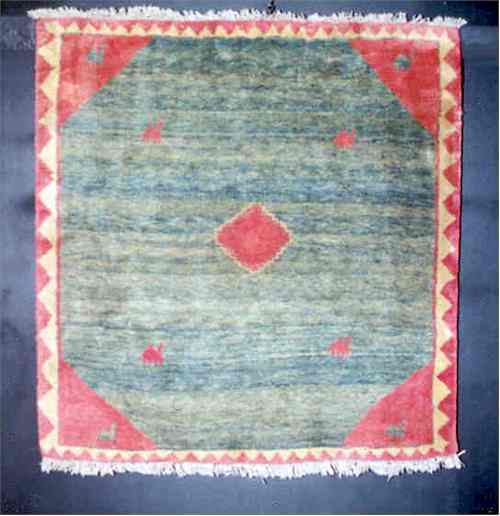 When the tribes especially the Qashqai and Khamseh settled into villages they made these rugs The wool is fantastic and the color is excellent. This is piece dates to mid twentieth century. All the dyes look good. 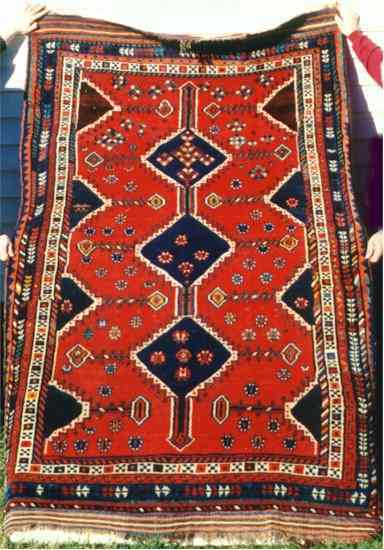 It is a handmade pile weaving from Iran. It is handmade and in Excellent condition. Size: 3 foot 8 inch by 5 foot 5 inch. Structure: Asymmetrical knot open to the left. 7 knots per horizontal inch and 7 knots per vertical inch. 49 per square inch (759.5 per square decimeter). Color: Raspberry, midnight blue, royal blue, ivory, yachting blue, burgundy, tangerine, gold. Weft: 2 shots raspberry wool. Ends: .5 inch plain weave and overhand knots with 1 inch warp fringe. Selvages: 8 cord overcastting yachting blue, raspberry wool. Further Notes: Excellent condition, wear to selvage and ends. 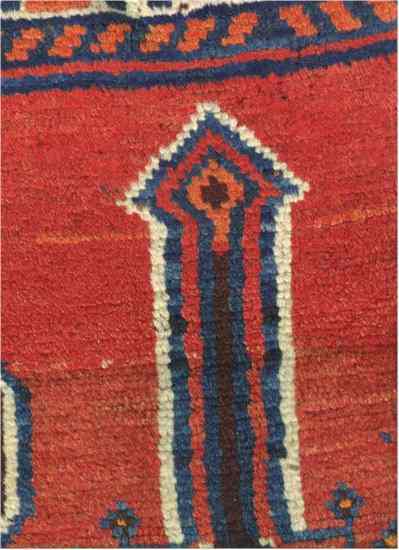 Description: Dark blue field with shaped red surround and three linked hooked pole medallions, inhabited by birds and other animals, floral border. The town of Abolvardi is just north of Shiraz. The Qashqai IL is a confederation of tribes in Southwest Iran in the Shiraz area. Of all the tribal groups of Persia, their weaving is most prized. Pictures alone cannot give you an accurate idea of the three dimensionality of design, the gloss of the wool, and the mastery of the weave. Even simple items like a saddlebag panel can be a work of art. Structure: Symmetrical knot. 11 knots per horizontal inch and 12 knots per vertical inch. 132 per square inch (2046 per square decimeter). Medium depressed. Warp: 2 ply wool, white. Weft: 2 shot red wool. Ends: Folded over and stitched. Further Notes: This piece is in good condition with a rebuilt corner, some areas of low pile, and a few use marks. The piece is separated from a Khordjin and as such must be considered a fragment. The colors in this piece are very good. Please note the apple green. They can get that color because of the whiteness of their wool; many others try that color and it comes out somewhat olive. 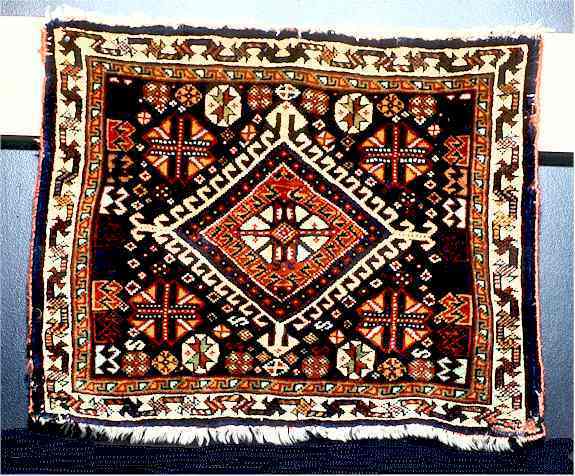 When you are trying to learn the many tribes of Southwest Persia, keep in mind that the Qashqai have the whitest wool of the highest quality. 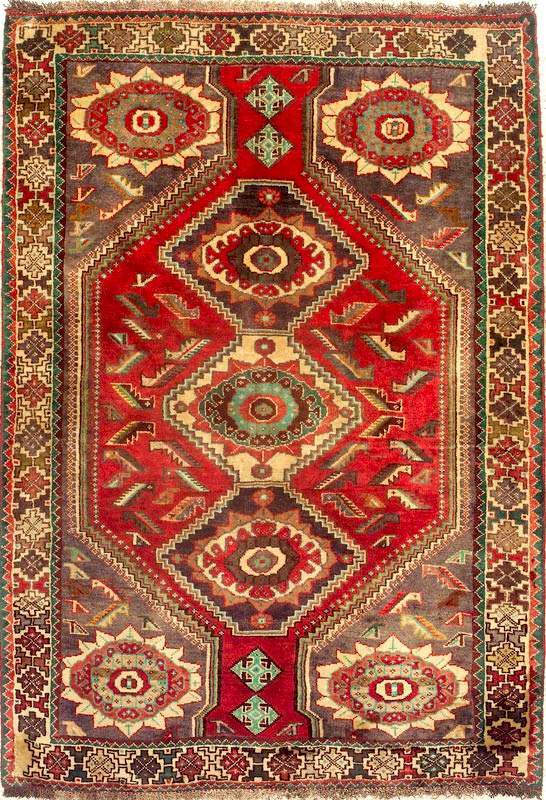 The Khamseh are master weavers, and some of their work is very similar, but the experts use wool color, feel, and quality to pick out the Qashqai. There is a debate in linguistic circles over whether Qashqai as a language is a distinct language or if it should be considered a dialect of Southern Azeribaijani. 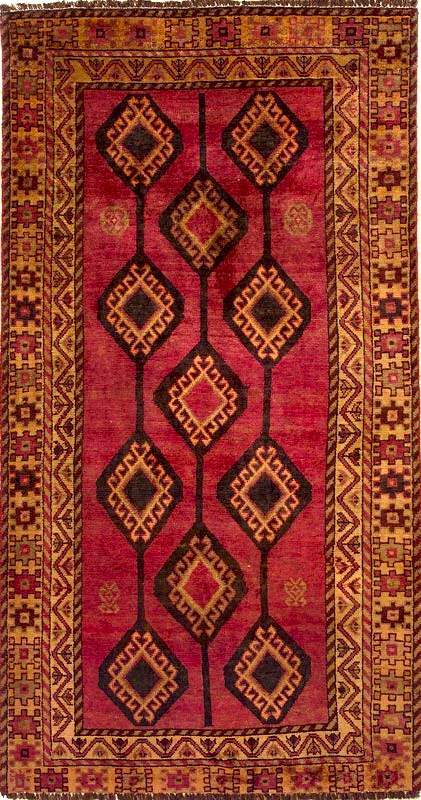 Personally, I have come to the conclusion that Qashqai must be a dialect of Southern Azeribaijani and that their weaving is a dialect of Southern Azeribaijani weaving. Condition: Heavy wear and damage. 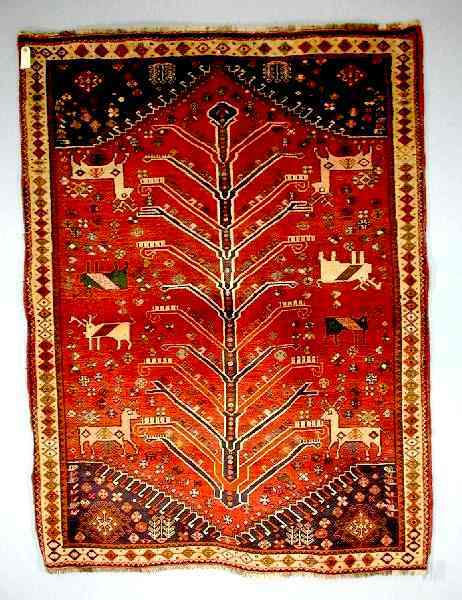 This rug is a Southwest Persian Gabbeh from Southwest Persia in the Shiraz area of Iran. These are very thick rugs originally used as sleeping rugs but now used as floor rugs. Ends: Post-hitch wharf binding with 2 inch warp fringe. Selvages: 1 cord overcastting red wool. Handle: Soft, pliable, heavy, durable, pile is 1 inch high. 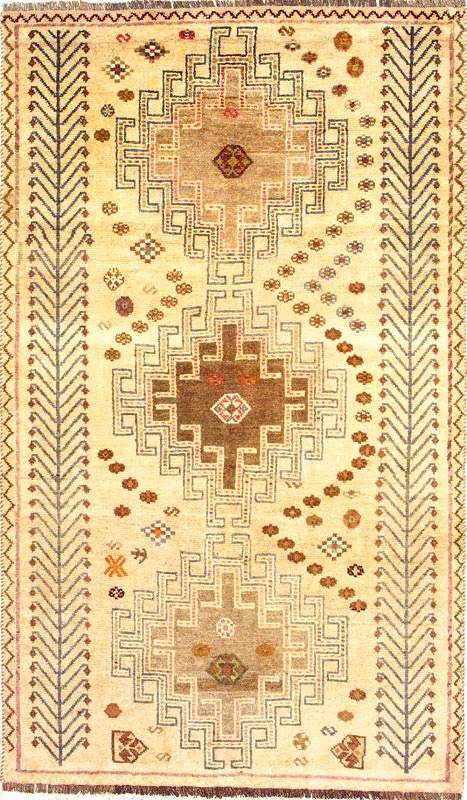 This rug has mellow colors and a simple, almost childlike, simplicity. The Vakil Mosque takes it's name from the Vakil (regent) Kerim Khan Zand. Karim Khan used the title Vakil to tie his claim to legitamacy to the last remnants of the Safavid dynasty. But in fact he was the Shah of Iran and Shiraz was his capital. He built the mosque from 1751 to 1773. 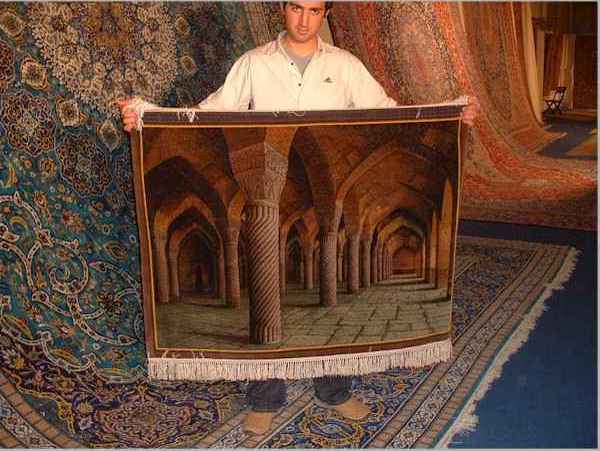 Notes: Shiraz is an ancient city in central Iran which produces a very warm and comfortable series of rugs. The designs are very simple and geometric, yet the design themes seem more sophisticated than primitive. Along with geometric motifs, often featuring huge diamond-shaped medallions, small animals or plants can also be seen in parts of the field. Colors include brown, rust, beige, with navy or black outlines. 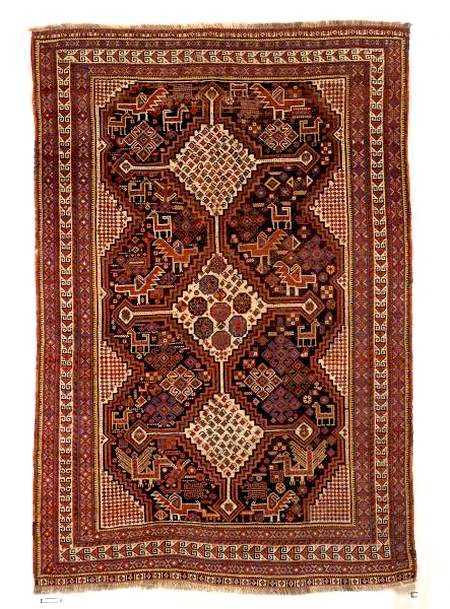 History & Construction: From the great southern province of Fars, through parts of the province of Kerman, nomadic tribes have a long history of rug weaving. 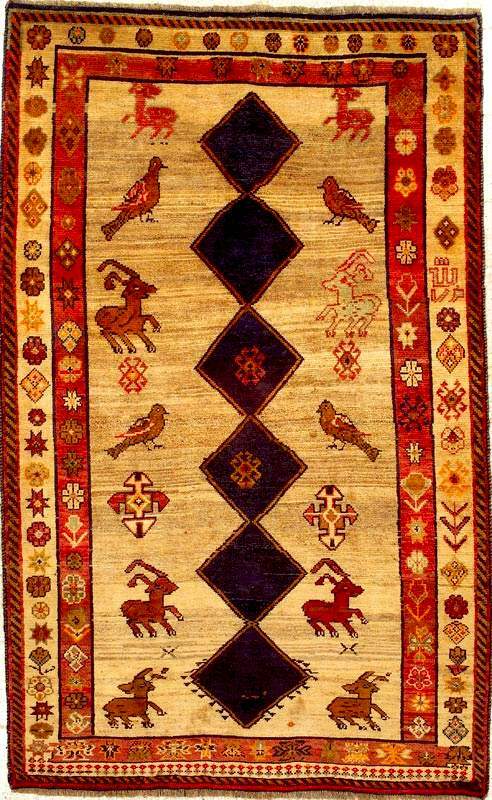 Afshar, Qashqa'i, Gabbeh and other tribal rugs are produced in the southern part of this vast area. The Afshar tribes are mostly in the province of Kerman, while the renowned Qashqai tribes are spread across both provinces and other parts of southern Iran. 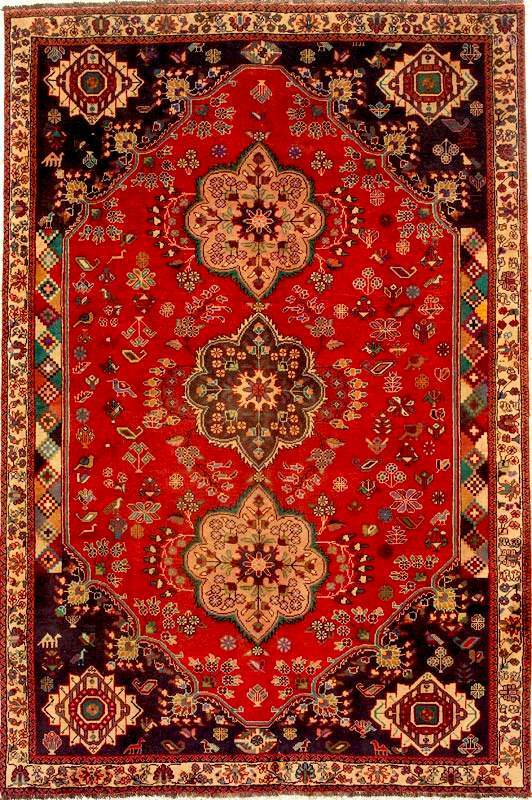 Some major rug-weaving centers include the historic city of Shiraz, in Fars; the famous city of Kerman; and the towns of Abadeh, Sirjan, and many other villages and nomadic groupings. 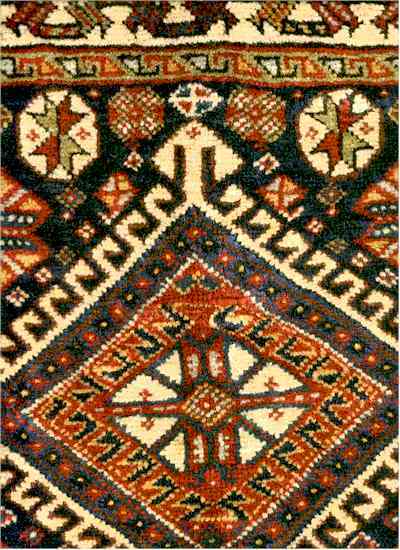 Strong Turkish and Kurdish weaving influences and techniques are visible, especially in the use of the symmetrical Turkish knot, woven up to a density of 100 knots per sq. in. The foundation is strong, durable cotton, or in other cases, wool or goat hair. 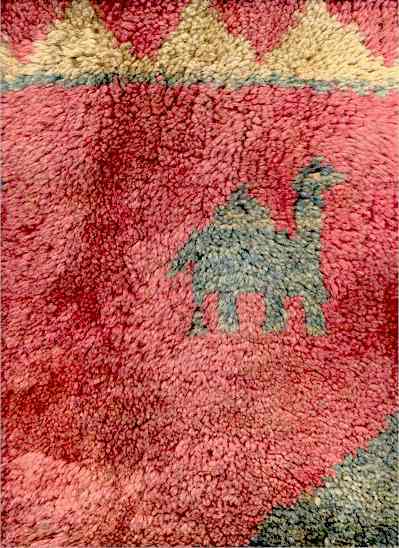 The pile is of very lustrous, fine wool that has been shorn from local herds, and colored mainly with natural vegetable and root dyes. 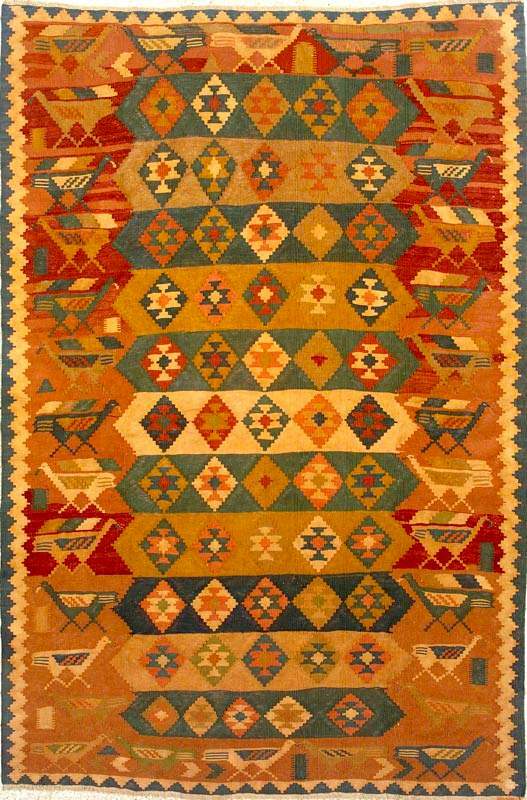 These simple, gentle weavers are naturally fond of bright, lively colors for their primitive homes. 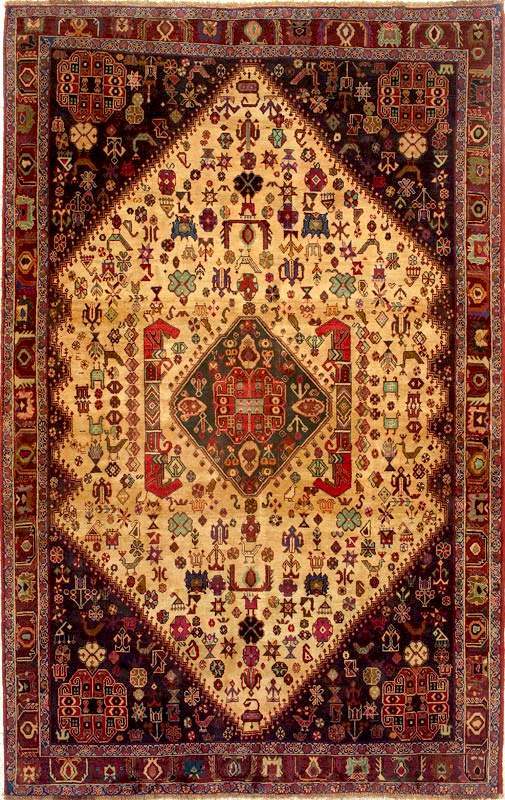 They produce rugs that are unique treasures and may take many months to complete. 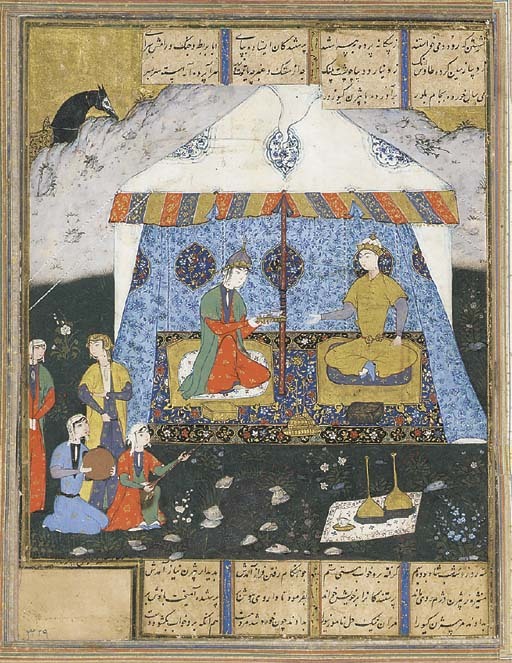 A leaf from a Shahnameh, gouache heightened with gold on paper, Manijeh and Bijan seated in a richly patterned tent with female musicians accompanying them, three lines of black nasta'liq arranged in four columns above and below, slight oxidisation and creasing, mounted, framed and glazed.